Yellow paired with grey or charcoal is a really popular combination right now, and with good reason; a bright, clear yellow is fresh and modern, but cool, neutral grey tempers the yellow and makes it calmer. We have several new cotton knit fabrics that the make the most of the yellow/grey combo. Knits are easy to wear and great for summer. Keep the styling simple; you don't need too much shaping for a close fit with knits. Scandinavian designer Lotta Jansdotter's new fabric collection is available at Treadle! The new collection, Glimma, reflects Lotta's unique modern style. Monochromatic prints with generous negative space evoke hand stamped prints. The shapes are at once abstract and organic; the color scheme is fresh and soft, softened by neutral grays. Steel blue, mustard yellow, and bright orange keep it modern. There's more in our store! Treadle Yard Goods is having a Memorial Weekend Sale! Come in Friday, 5/24 through Sunday, 5/26 for 20% off fabrics, ribbons, and trims, including silk, oilcloth, designer cottons and ribbons, linen, and more! We will be closed Monday, 5/27 for Memorial Day and Sunday, June 2 for Grand Old Day. Whether you are just beginning or are an experienced sewer, there is a class for everyone! The basic sewing series builds a great foundation, and you can try some special techniques such as zippers and sleeves, plus project classes from corsets and jackets to quilts and cushions. We have a wide selection of classes for kids as well! Our kids' classes start as young as age 6 and are appropriate for up to age 13. Sign up early - these classes fill up fast! To enroll in our classes, please stop by the store or call us at 651.698.9690. Treadlette Nina's latest creation for display is this funky, mod TV dress. Nina used McCall's pattern 6322 and used piping instead of a contrast band to freshen the look, while delineating the empire seamline with some contrast. Novelty prints like this are fun to wear and perfect for summer. Keep the style simple and casual to match a whimsical print's easy-going attitude. 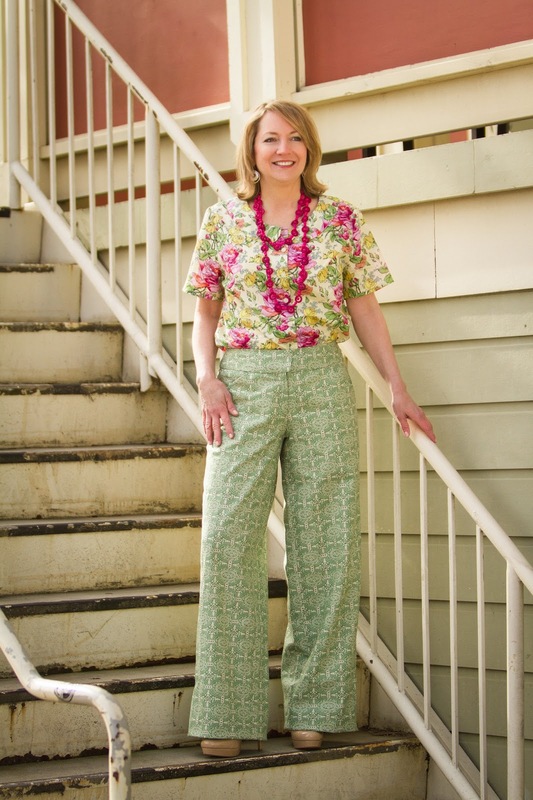 The Amy Butler Trunk Show at Treadle Yard Goods begins May 16th! 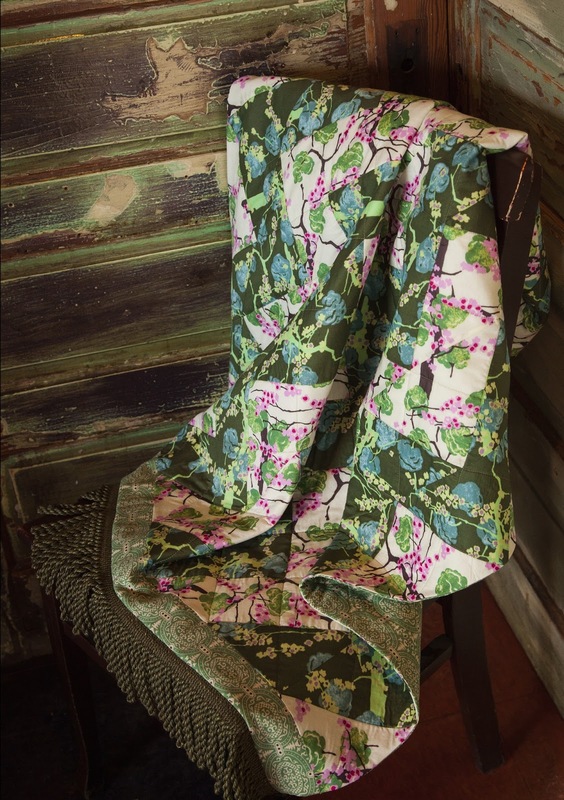 Come in and see this amazing collection of garments made in Amy Butler's new fabric line, Alchemy. 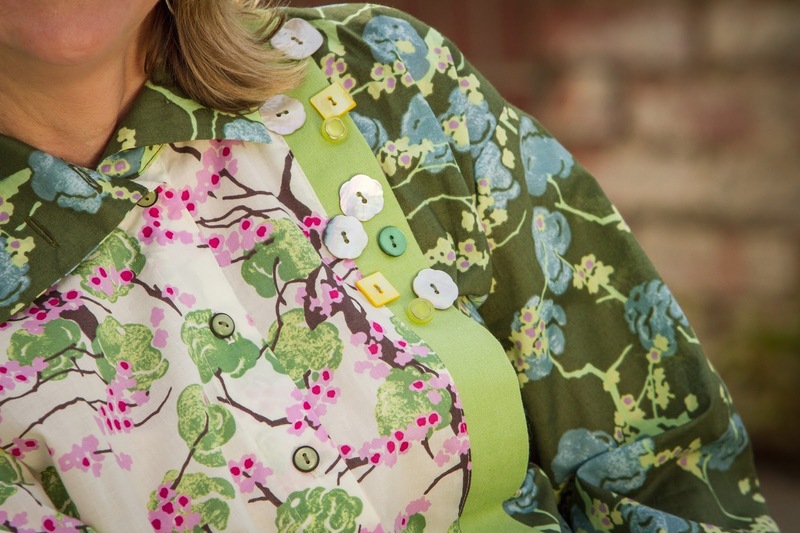 Dresses, pants, blouses, coats, skirts, and bags will be on display - all made from patterns produced by independent pattern companies such as Colette, The Cutting Line, Sewing Workshop, Indygo Junction, and more! Patterns and fabrics are available at Treadle, so you can get inspired, then have everything you need to make your own versions of these wonderful designs. There's so much more to see in the store. Come take a look! Treadlette Jennifer was spotted in the store the other day wearing this super cute and simple spring top. She was good enough to model for few photos. 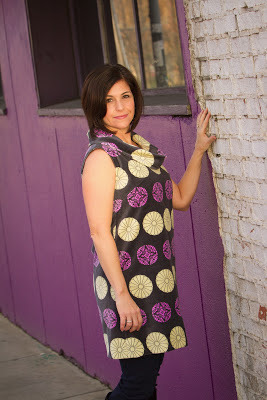 Jennifer used New Look pattern 6086, a collection of tunic tops and tanks. Shaped slightly to flare over the body, the pattern features side bust darts to create a smooth fit that skims over the body, and side vents to keep the fit easy over the hips. This example is made in a Liberty cotton lawn print which is sadly sold out at Treadle, but we have so many other beautiful cotton lawn prints from Liberty and other manufacturers, you'll be sure to find something equally gorgeous for your own spring and summer tops. Soft, lightweight, with a fine, dimpled texture woven in, cotton seersucker is a traditional choice for summer garments. In bright or pastel color combinations, it's often made with a striped or checked design. We have several pieces in the store right now. The textured surface allows the fabric to float over the body, instead of clinging or sticking. Just what you need on the hot, sweaty days of summer! And we know those days will be here soon enough. 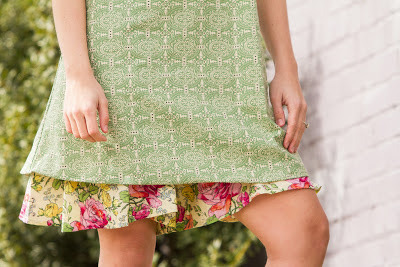 Use this seersucker for a simple blouse to wear alone or to layer over a tank top, or a sweet, simple dress or skirt with a relaxed, casual appeal. The Alchemy collection is the talk at Treadle right now, but also new from Amy Butler is this stunning collection of ribbons, produced by Renaissance Ribbons. These richly patterned wide jacquard ribbons glow with saturated colors, and the narrower geometric pieces make a perfect complement. Pair these ribbons with a solid color fabric to highlight their colorful charm, or take it up a notch and use them with some of Amy's new fabrics for a truly eclectic look. The long-anticipated moment has finally arrived: the new Amy Butler collection is now in stock at Treadle Yard Goods! But the fabric is just the beginning; Treadle will also be hosting a Trunk Show of wonderful garments made in Amy's new fabric collection. The Trunk Show starts May 15th; keep your eyes on our blog for more information. We've been eagerly awaiting her new collection, Alchemy, for a while, and fans of Amy Butler's unique style will not be disappointed. There's plenty of the classic damask and medallion styles that Amy is famous for, but she's also added some freshness to Alchemy with large, open florals and botanical imagery. We're also seeing an incredible variety in the textures and weaves available. Instead of just cotton sheeting, we have a broad array of fabrics, from drapey rayon and silky cotton lawn to nubbly linen blends and rich plush cotton velvet. The palette is largely cool tones like green, blue, and violet, with sparks of bright warm colors like pink and orange added to the mix in perfect balance. Amy's amazing color sense really comes through in Alchemy. With this variety of textures, fabrics, and prints, the possibilities are endless. The linens would make great jackets or bags. 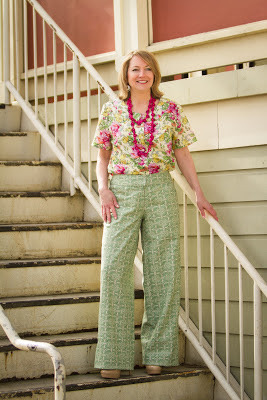 Rayon and cotton voile are ideal blouse or dress fabrics. And the velvet and sheeting would be lovely in quilts, throws, and pillows. 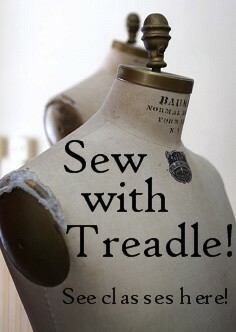 There's more in our store, so stop by Treadle and check it out!